Following an intense 18 month study to determine if NASA’s New Horizons spacecraft faced potentially destructive impact hazards during its planned 2015 flyby of the Pluto binary planet system, the mission team has decided to ‘stay the course’ – and stick with the originally planned trajectory because the danger posed by dust and debris is much less than feared. The impact assessment study was conducted because the Pluto system was discovered to be much more complex – and thus even more scientifically compelling – after New Horizons was launched in January 2006 from Cape Canaveral in Florida. Two years ago researchers using the iconic Hubble Space Telescope discovered two new moons orbiting around Pluto, bringing the total to 5 moons! It was feared that debris hitting the moons could have created dangerous dust clouds that in turn would slam into and damage the spacecraft as it zoomed past Pluto at speeds of some 30,000 miles per hour (more than 48,000 kilometers per hour) in July 2015. “We found that loss of the New Horizons mission by dust impacting the spacecraft is very unlikely, and we expect to follow the nominal, or baseline, mission timeline that we’ve been refining over the past few years,” says New Horizons Project Scientist Hal Weaver, of the Johns Hopkins University Applied Physics Laboratory, in a statement. After both the team and an independent review board and NASA thoroughly analyzed the data, it was determined that New Horizons has only a 0.3 percent chance of suffering a mission destroying dust impact event using the baseline trajectory. Hubble Space Telescope view of Pluto and its known moons. The 0.3 percent probability of mission loss is far less than some earlier estimates. This is really good news because the team can focus most of its efforts on developing the flyby encounter science plan when New Horizons swoops to within about 12,500 kilometers (nearly 7,800 miles) of Pluto’s surface. Pluto forms a “double planet” system with Charon, its largest moon. Charon is half the size of Pluto. But the team will still expend some effort on developing alternative trajectories – known as SHBOTs, short for Safe Haven by Other Trajectories, just in case new information arises from the ships camera observations that would force a change in plans as New Horizons sails ever closer to Pluto. “Still, we’ll be ready with two alternative timelines, in the event that the impact risk turns out to be greater than we think,” says Weaver. Indeed the team, led by Principal Investigator Alan Stern, of the Southwest Research Institute is finalizing the encounter plan this month and plans a rehearsal in July of the most critical nine-day segment of the baseline flyby trajectory. New Horizons will perform the first reconnaissance of Pluto and Charon in July 2015. The “double planet” is the last planet in our solar system to be visited by a spacecraft from Earth. And New Horizons doesn’t’ stop at Pluto. The goal is to explore one or more of the icy Kuiper Belt Objects (KBO’s) further out in the Solar System. 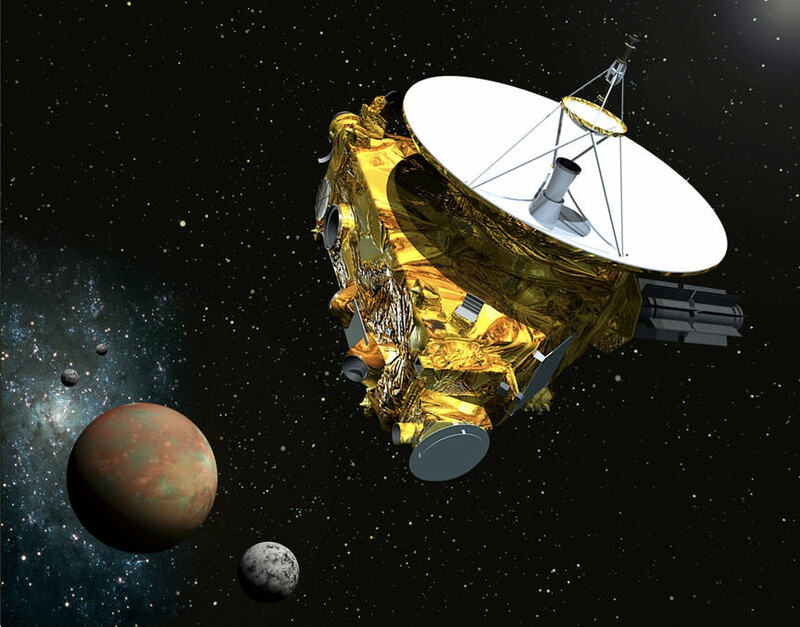 The team will use the Pluto flyby to redirect New Horizons to a KBO that is yet to be identified.